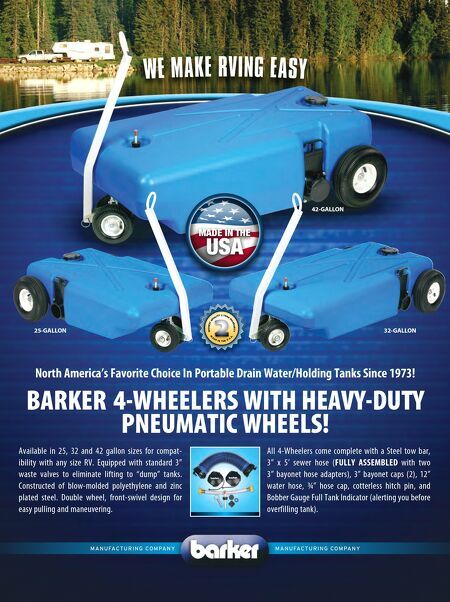 North America's Favorite Choice In Portable Drain Water/Holding Tanks Since 1973! BARKER 4-WHEELERS WITH HEAVY-DUTY PNEUMATIC WHEELS! Available in 25, 32 and 42 gallon sizes for compat- ibility with any size RV. Equipped with standard 3" waste valves to eliminate lifting to "dump" tanks. Constructed of blow-molded polyethylene and zinc plated steel. Double wheel, front-swivel design for easy pulling and maneuvering. 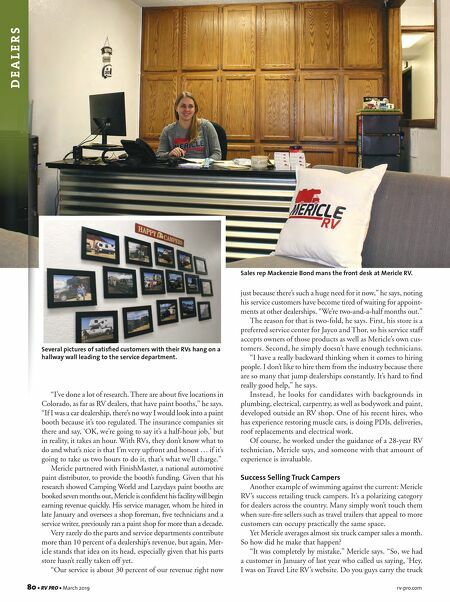 WE MAKE RVING EASY MADE IN THE USA H I GH E ST Q UA L I TY 2 Y E A R W A R R A N TY M A D E I N T H E U . S . A . 42-GALLON 25-GALLON 32-GALLON M A N U FAC T U R I N G CO M PA N Y M A N U FAC T U R I N G CO M PA N Y All 4-Wheelers come complete with a Steel tow bar, 3" x 5' sewer hose (FULLY ASSEMBLED with two 3" bayonet hose adapters), 3" bayonet caps (2), 12" water hose, ¾" hose cap, cotterless hitch pin, and Bobber Gauge Full Tank Indicator (alerting you before overfilling tank).